Pioneers in the industry, we offer heat exchangers, heat exchanger with triple expansion bellows, shell & tube heat exchanger, heat exchanger with vent condenser, heat exchanger with titanium tubes and heat exchanger with projected tubes from India. We manufacture heat exchangers such as steel heat exchanger, fixed shell heat exchangers, stainless steel heat exchanger, tube heat exchangers, floating heat exchanger, fully double expanded heat exchanger and double tube sheet type heat exchanger. 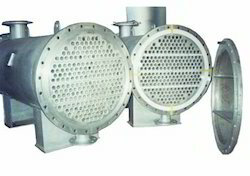 Manufactured using stainless steel of grade SS 304, SS304L, SS316 and SS 316L, our shell and tube heat exchangers are used for varied applications in the industry like fertilizers, chemicals & petrochemicals, automobiles, cement. 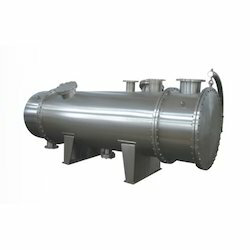 We are the leading manufacturer, supplier and exporter of Heat Exchanger with Tripple Expansion Bellows which is manufactured under the highly skilled professionals. 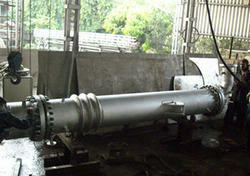 We have established ourselves among the eminent Suppliers of Shell & Tube Heat Exchanger across the globe. 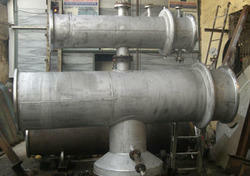 The range of heat exchangers that we are making available are known for trouble-free and efficient operation. It effectively transfers energy in the form of heat from one fluid to another fluid. 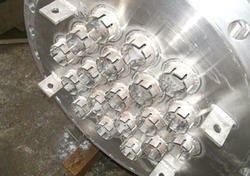 The components and raw material used in manufacturing this system is sourced from the authentic vendors of the market. Considering various requirements of our clients, we offer the entire range in various configurations to choose from. The offered system is widely praised by our clients for its precise design and cost-effectiveness. 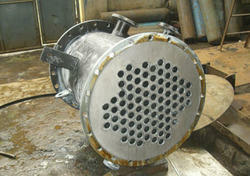 We manufacture a variety of Heat Exchangers with Vent Condenser depending upon Customer's requirement. Manufactured using high grade components and latest technology, this range is highly acclaimed in the market. Our customers can avail this system as per their specific need at reasonable prices. We are among the well known companies in the field of manufacturing and exporting of Heat Exchanger with Titanium Tubes. This system is precisely manufactured by our professionals using optimum quality components in conformity with international quality standards. We manufacture these using fine quality material which we sourced from the reliable vendors of the industry. Moreover, we also assure timely delivery of our products. Being a client centric firm we are involved in offering an excellent range of Heat Exchanger with Projected Tubes. In order to ensure the quality and avoid any kind of defect, this system is precisely tested against various quality parameters by our quality controllers. Apart from this, we offer this system as per the requirements of the customers at reasonable prices.